02/01/2016: Moved to separate page. 11/25/2011: Added an H.D. Smith 660-6 Screwdriver. 11/24/2010: Added a H.D. Smith Pipe Wrench. 09/07/2009: Added H.D. Smith Offset Combination Pliers. 08/30/2009: Added a H.D. Smith 8 Inch Monkey Wrench. 06/26/2009: Added a H.D. Smith Valve Spring Lifter. 06/23/2009: Added H.D. Smith Company. The H.D. 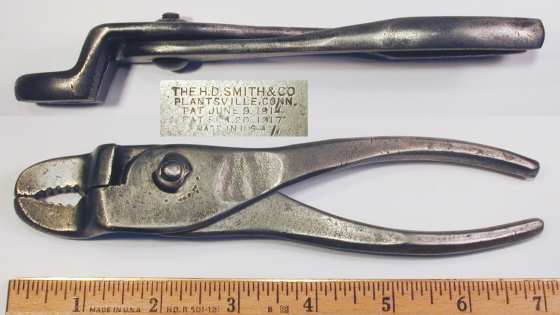 Smith Company was an important early drop-forge merchant and later became well known for its line of "Perfect Handle" tools. The H.D. Smith Company was founded in 1855 in Plantsville, Connecticut. The company operated as a foundry and merchant drop-forger, and in the latter role was possibly the first of many such businesses. 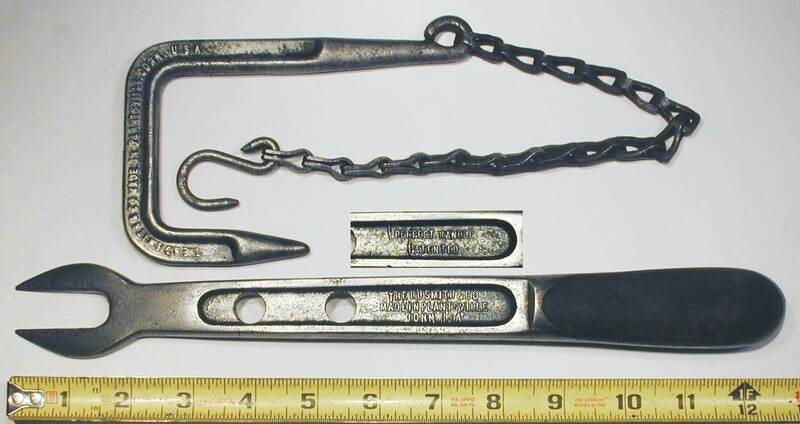 After 1900 tool production became an important part of the company's business, and their best known products was a line of tools with riveted wooded handles sold under the "Perfect Handle" brand. The tools supplied with "Perfect" handles included screwdrivers, pipe and nut wrenches, open-end wrenches, and even a valve lifter. The advertisement at the left was published on page 132 of the January 2, 1919 issue of American Machinist and illustrates a number of the tools available from H.D. Smith. Note that the text at the bottom of the ad makes the claim that the company was the first drop-forger. H.D. Smith used a logo with an "S" inside a circle and claimed it as a trademark, but we haven't found the registration yet. Currently we don't have any catalogs for H.D. Smith. Fig. 1. H.D. Smith 660-6 "Perfect Handle" Screwdriver, with Insets for Reverse and Side View, ca. Early 1900s. Fig. 1 shows an H.D. Smith 660-6 flat-tipped screwdriver, marked with the S-Circle logo forged into one side, with "Improved" and "660" plus "Pat Ap'l'd For" forged into the reverse. Fig. 2. H.D. Smith "Perfect Handle" 8 Inch Monkey Wrench, with Insets for Side View and Marking Detail, ca. Early 1900s. The patent dates are marked "Pat'd Oct. 30-1900 Jan. 15-1901 Feb. 26-1901", with the first date corresponding to design patent #D33,468, issued to Amos Shepard on October 30, 1900. This patent shows a design for the body and handle of a wrench very similar to the present item. Fig. 3. H.D. Smith "Perfect Handle" 14 Inch Pipe Wrench, with Insets for Side View and Reverse Detail, ca. 1914 to 1920s. Fig. 3 shows an H.D. 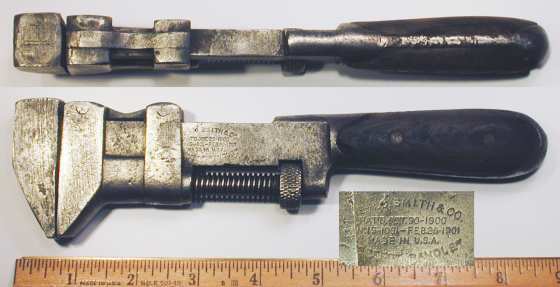 Smith 14 inch pipe wrench, marked with "Perfect Handle" and "Patented" forged into the shank, with "The H.D. Smith & Co." and "14 In." forged into the reverse. The overall length is 13.4 inches closed and 15.4 inches fully opened. The finish is plain steel. The patent notice refers to patent #1,122,335, filed by W.S. Thomson in 1913 and issued in 1914. The patent illustration shows a pipe wrench closely resembling the present example. Fig. 4. H.D. Smith "Perfect Handle" [No. 650] Valve Spring Lifter, with Inset for Reverse Detail, ca. 1910-1920. Fig. 4 shows an H.D. Smith valve spring lifter of a unique design, employing a hook and chain to provide the fulcrum for the lever. The lever is marked with "The H.D. 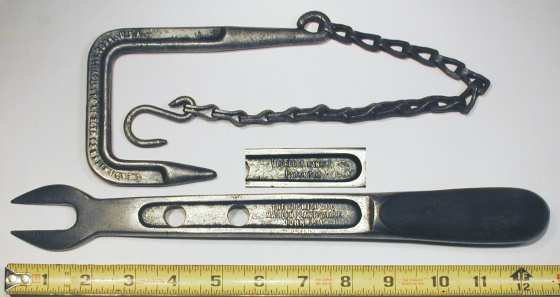 Smith Co." and "Made in Plantsville, Conn, U.S.A." forged into the shank, with "Perfect Handle" and "Patented" forged into the reverse. The forged hook is also marked, with the same company information on one side and "Drop Forged" on the reverse (not shown). The overall length of the lever is 12.7 inches, and the maximum length of the chain and hook is 17.5 inches. The finish is plain steel. Although not marked with a model number, this tool is listed as No. 650 in a 1916 J.M. Waterston tool catalog. The operation of this tool may not be immediately apparent due to its unusual design. The point of the large hook is first placed in a suitable depression on the top of the engine block, with the chain hanging over the side near the valves. With the small "S" hook removed from the end, the chain is then passed through one of the holes in the lever arm, and the "S" hook is inserted below to set the fulcrum at a suitable point. The valve spring can then be lifted using the lever handle. Fig. 5. H.D. Smith Offset Combination Pliers, with Insets for Side View and Reverse Detail, ca. 1917-1930. Fig. 5 shows a pair of H.D. Smith offset combination pliers, stamped on the reverse with "The H.D. Smith & Co." and "Plantsville, Conn.", plus two patent dates and a small "Made in U.S.A." at the bottom. The first patent date "Pat. June 9, 1914" refers to design patent #D45,919, filed by W.S. Thomson in 1913. The second date "Pat. Feb. 20, 1917" refers to patent #1,216,886, also filed by W.S. Thomson in 1913, but not issued until 1917.